Free and open to the public. Free parking available. Cassils, along with community members, advocates, and allies, will physically push a 1,300-pound bronze monument, Resilience Of The 20%, to sites of resistance and places where violence against marginalized peoples have occurred in downtown Omaha. With the world premiere of Monument Push in Omaha, Cassils calls attention to overlooked trauma and the perseverance of the human spirit—raising questions about memory, witnessing, and forgotten histories. The performance will begin and end at Bemis Center at 724 S. 12th Street, Omaha, NE. 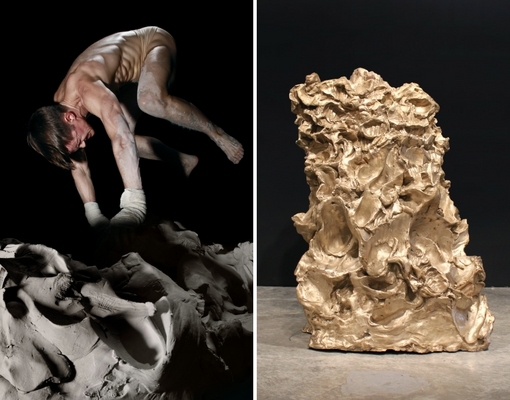 Resilience of the 20% is a sculpture formed by a series of kicks and punches during a 2013 performance of Becoming An Image where Cassils attacks a 2,000 pound clay block in total darkness. The clay sculpture was then cast in bronze. The once malleable object is monumentalized, reversing the terms of a traditional memorial or monument.